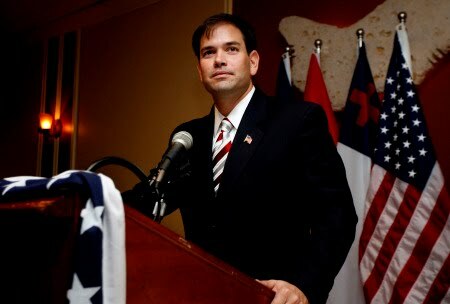 Marco Rubio has sent a letter to Florida Governor Charlie Crist asking for 10 debates covering many important issues. 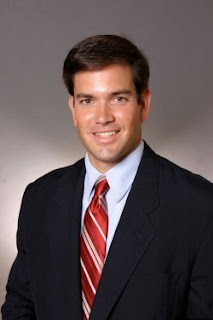 On August 24, 2010, Floridians will head to the polls to select their parties’ respective candidates for the U.S. Senate general election. Over the next 14 months, you and I will have the privilege of meeting many of these voters and directly making the case for our candidacies. One of the most important and time-honored ways of engaging voters is through debates about our ideas, principles, policies, records and the direction each of us would lead our state and country. To this end, I am pleased to accept Leadership Florida’s debate invitation. However, I also share your belief, as articulated during the 2006 gubernatorial primary, that one debate is not enough. Because Florida’s next U.S. Senator will be entrusted with steering our state and country during an era of serious domestic and international challenges, it is imperative that we provide Floridians with numerous opportunities to learn more about the choice before them in this election. As fellow Republicans, you and I have a great deal in common. However, we must also acknowledge the differences between us on issues like stimulus spending, tax reform, judicial appointments, lawsuit reform and global warming. Several debates will help bring these and other differences to light, including the priorities we would fight for, the votes we would cast and the path we would pursue when faced with hard choices. Accordingly, I invite you to join me in a series of at least ten debates, beginning this fall. Organized by GOP organizations in each of Florida’s media markets, these unprecedented debates would cover a full range of state and national issues, while showcasing Florida as a national leader in promoting the very best political discourse the Republican Party has to offer. It is my great hope that these debates will aspire to fulfill the promise of the legendary Lincoln-Douglas debates and the Goldwater-Kennedy debates which were discussed between the candidates but never realized. As you approach your third decade in elected office, you have fostered a reputation as a formidable fundraiser who has broken many of Florida’s fundraising records. I am sure this campaign will be no different and fully expect that I will have to work twice as hard as you to remain competitive. While we are opponents for the same office, I am also confident we can maintain a cordial and respectful debate that will help our campaigns rise above the typical 30-second commercials, slick slogans and bumper stickers that define too many of our country’s political contests. In order to proceed, I respectfully request that you appoint a campaign representative to communicate directly with Brian Seitchik, my campaign manager, and begin formalizing a debate schedule. I look forward to your reply and the contest ahead, and wish you and your campaign the very best.